The kitchens in the Winter Palace consisted of three main departments; cooking, wine and confectionery. 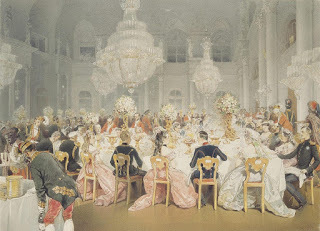 A part of the confectionery was the making of ice cream, a favorite with the family and in great demand during the imperial balls. Catherine the Great’s Sevres service for sixty people included ten vases with handles in the form of a frozen fountain with sixteen bowls, twelve trays with seven bowls and eight trays with six cups for ice cream. In the 1840s-50s, two plates of candy and two bowls of ice cream on ice were prepared daily for Empress Alexandra’s rooms. During the Hermitage performance on February 7th 1851, thirty dishes of ice cream and sixty decanters of lemonade were placed in the theater. At the dinner later, there were two hundred and twenty plates of sweets and fifty-seven dishes of ice cream on tables for the 570 attendees. There were occasional restrictions. In August 1848 during the cholera epidemic, Nicholas I ordered that no sturgeon, truffles or ice cream be served as a precaution. 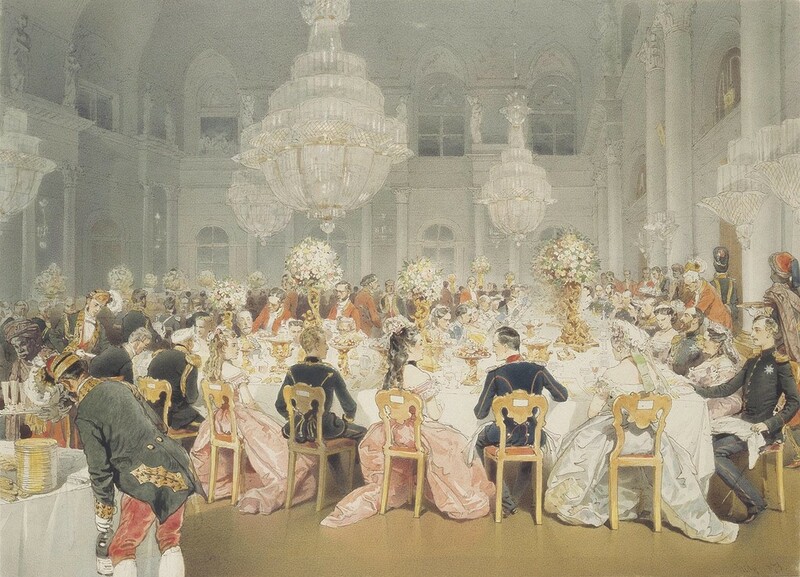 In January 1874 during the marriage festivities of Alexander II’s daughter Marie, the confectionery department placed seven dishes of ice cream in the family rooms including the Duke of Edinburgh. Neither his reaction to the ice cream nor if it was common practice in the English court is known. Court officials and the four chefs would investigate and test all new kitchen appliance designs. In the late 1840s, they bought American Nancy Johnson’s hand-held ice cream device. 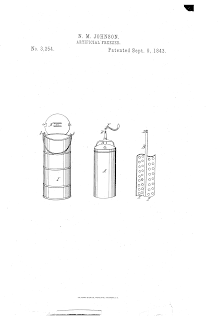 In 1853, the Dutch confectioner Meris -Meltzer’s ‘machine for easy and fast preparation of ice-cream’ was used in the palace kitchen. Lots and lots of ice cream,yum! I always wondered what the kitchen in the palace looked like, that's the first picture of it I've ever seen of it, thanks for posting it. As always Joanna, great post with lots of interesting info, methinks the members of the royal family had a sweet tooth with all that ice cream and confectionery? There are many descriptions of the kitchens and the changes during the reigns but no photographic images. The family also were supplied with plates of fruits etc. I have lists of what was served each day in their rooms. Also they were never alone so would share the daily plate displays with their lady-in-waiting or military governor etc. Well that brings me to a curious question;would the job of lady-in-waiting or military governor have been a good position to work in, were they treated well, good wages, were they happy doing what they did? In one way the positions were good - close to the family, a salary and pension, servants and carriage at their disposal. But the court was a closed society, insular and gossipy. Some wrote accounts and were negative so it is difficult to ascertain each individual. The children's tutors and governesses must have been stressful life. Thank you for answering my question, you do wonder about the people under or the one's who work behind the scenes lived. The servant jobs were inherited - sons and daughters would grow up in the milieu and learn the trades of their parents. A known person was reliable and some beloved by the imperial family. The problems arose more within the household - officials, equerries, ladies. Higher class - more gossip and internal fights for jockeying to be close to the members of the family. Do you know if there was one single kitchen in the palace, or many kitchens serving the various apartments? There was the 'main' kitchen now 101 on my 1st floor plan. There were different areas for kitchens for cooking meats, etc and baking. Each part of the private apartments had their own small kitchen or buffets. 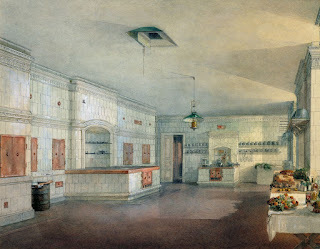 For example Grand Duchess Marie Alexandrovna's kitchen in the 1860s was across the corridor from her suite of rooms. have you come across any mention or indication of the what flavors of ice cream were provided and/or whether the family had any personal preferences? The imperial family from the days of Catherine loved ice cream. The archival documents list menus and various fruits in season that were given to each but info on actual recipes is scarce, still to be revealed.